There are a number of individuals who frequent the downtown core in Cardston who suffer from issues related to mental health or substance abuse. Many are decent, polite individuals who are victims of tragedy, or of their own circumstances. You may be approached by some of these individuals while visiting the downtown core. It is ok to say no when some one accosts you for money or something else. 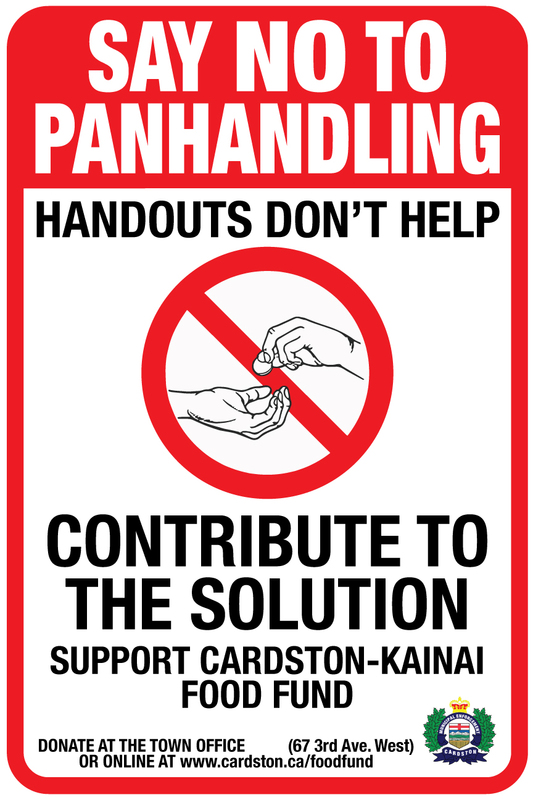 Giving money to panhandlers is discouraged, as in many cases money collected by panhandlers is used to support damaging addictions. Resources already exist which can provide these people with all the help they need, like the Moses Lake Shelter and Soup Kitchen located near downtown Cardston. You can make a difference by donating to to the Cardston-Kainai food fund, which provides funds to the shelter. Donations may be made in person at the Town Office (67 3rd Ave W) or online. To donate online or with your mobile divice, you may send an e-transfer from your bank account to foodfund@cardston.ca. All proceeds go towards purchasing food to help feed those in need in Cardston. Click on image to download and print 11 x 17 PDF.